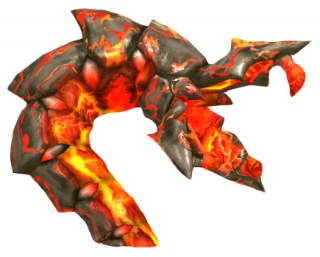 For the enemy from Sonic Spinball, see Magma Worm. Iblis Worms are supernatural fire-beasts conjured and controlled by Iblis, the Flames of Disaster. First seen in Sonic the Hedgehog (2006), they went unnamed in their debut game, but Omochao refers to them as Iblis Worms in Sonic Generations. These fire monsters look similar to Iblis' Phase 2 form, but with a simpler head. Their method of attack consists in bursting out of the ground, walls or ceilings, and that shoot some kind of spiked ball of energy out of its mouth. Sometimes they will burrow themselves again and appear somewhere else, or sweep their body around as an attempt to hit their enemies. Like every Iblis monster, they are red-brown coloured and weaker (one hit to destroy) then their Mephiles' counterpart, which is purple-black coloured and is stronger (two hits to destroy). The Iblis Worms return to Crisis City in Generations, where they behave roughly in the same feral manner. Now a noticeable yellow marker will show where they'll emerge when approached by the player. They still spew fireballs and have a nasty tendency to do so from the safety of the background. Still useful for traversing walls and ceilings, and still done after a single attack. This page was last edited on 3 April 2018, at 17:18.